Tiffany Vargas, Product Manager at Lifespan Brands, moonlights as a yoga instructor at CorePower Yoga in Buffalo Grove, IL and other area studios. She worked very hard over the past year to get certified to teach yoga classes and has really enjoyed bringing her love of yoga, fitness and healthy living to her students. Tiffany also loves to use her creativity to find exciting ways to engage students in her classes and keep them motivated with the right music and exercise equipment. Recently, she was able to combine her day job of developing Lava® lamps at Lifespan Brands, with a special class called Glow Sculpt. Yoga Sculpt is a high intensity, yoga class with weights and cardio. It combines traditional yoga postures and adds an element of weight lifting within each exercise. Fun, upbeat music is played to keep your energy up throughout class and having fun is a MUST! For the Glow Sculpt class, Tiffany dimmed the lights and added glowing elements for a new party atmosphere. The Glow Sculpt class was just like going to the club and working out. The studio had glow sticks and body paints for the students to use when they arrived at the studio and encouraged them to wear bright colors to class. Once they entered the room, the party started. Club music played as black lights and Lava® lamps lit up the room. Students loved Glow Sculpt and asked CorePower Yoga to do it again soon. 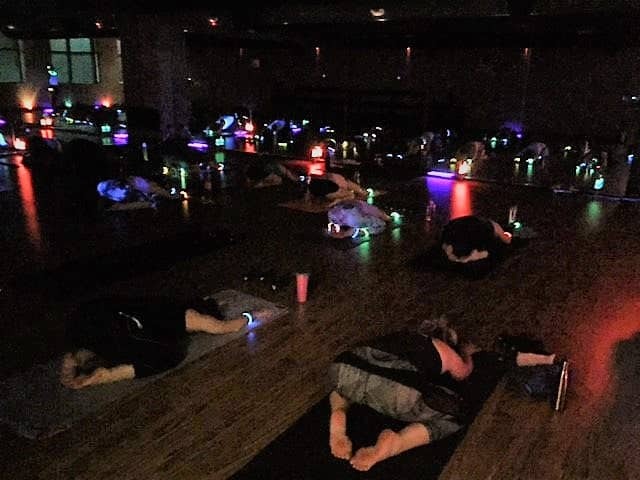 There is nothing like having fun when you work out and adding the element of Lava® lamps and glow gave the students another reason to come to yoga that night. Each month, the studios at CorePower Yoga have themed classes to give their students an opportunity for something different than the classes they regularly attend. Some include themed music and costumes, while others incorporate the core values and traditional teachings behind yoga such as chakras and meditation. Mediation is another important part of mental and physical health that is closely connected with yoga. It is all about connecting your breath and slowing your mind. While this was not the intention of the Glow Sculpt class, elements of meditation are incorporated into cool down stretches of many yoga classes. A Lava® lamp would be a great visual element for anyone to use in meditation, regardless if you are doing yoga with it. The soft glow of the lamp will calm the mind and the slow movement of the Lava flowing up and down the globe could help slow down breath and regulate your heart rate.